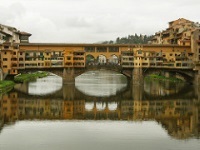 The Ponte Vecchio's status as the oldest bridge in Florence saved it from destruction during the Nazi retreat from Italy in 1944. They defied orders to blow up the stately bridge straddling the Arno River and bombed the ancient buildings on either side of it instead. The Arno Flood of 1966 also tested the bridge's resilience, and swept parts of it away in its powerful current. The most affected sections were the iconic overhanging shops belonging to the gold and silversmiths. In 1593 the original tenants - butchers, tanners and blacksmiths - were evicted from the workshops because of the noise and stench they created, to make way for more refined merchants and craftsmen. To one side of the bridge is the majestic bust of the most famous Florentine goldsmith, Benvenuto Cellini. Perched above the shops is a secret passageway, the Vasari Corridor, providing an elevated link to the Palazzo Pitti via the Uffizi. It was the private walkway of the Medicis who could move between the various residences without having to rub shoulders with the riff raff. The Ponte Vecchio is charming at night, when it is lit up and the bright shops beckon in visitors. It is an icon of Florence and an enduringly popular attraction.